After Cheng Meng, I was left with a basket of apples. To have one a day may keep the doctor away, but by the time we reach the last apple it would surely have rotted. At the same time, I saw Linnh Lee's Apple Pie recipe, and one thing led to another and I ended up deciding to make Apple Pie. Apple Pies are typically made with Granny Smith Apples(green apples) because both the taste and texture are superior to red apples. 1. Mix cake flour, sugar and salt well. 2. Use hands to knead the butter and step (1) until a crumbly texture is achieved. 3. Add in ice water and continue kneading to form a dough. Wrap the dough with cling wrap, then keep it in the fridge for later use. 2. Melt the butter in a pan, add in the apple dice and stir well. 4. 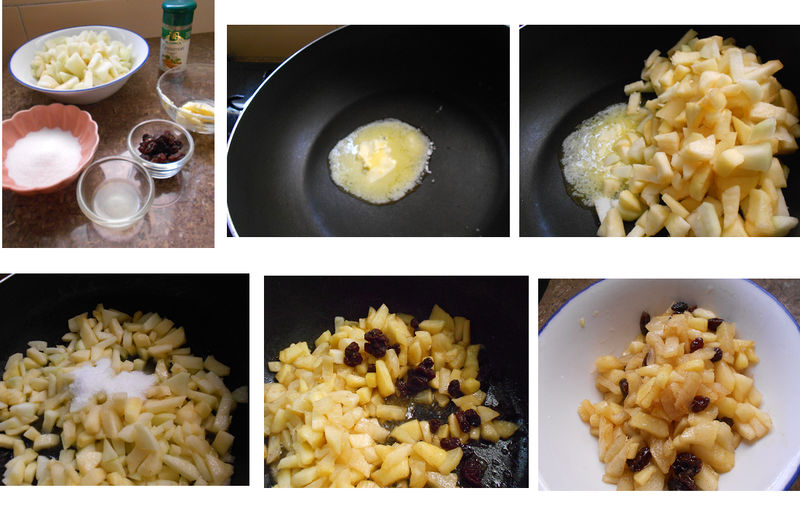 Cook the apple dice with low flame for about 4 -5 minutes until it softens and the the gravy thickens. 1. Take out the dough from the fridge, flatten it till 0.5cm thick and place it into the pie mould. 2. Scoop in the apple filling. Cut the remaining dough into strips and criss-cross them on top. 3. Lastly, brush with egg wash and bake in a preheated oven at 200°C for 10 minutes, then lower the temperature to 190°C and bake another 15 minutes or until it turns golden. This recipe is adapted from Linnh's, with slight editing based on suggestions from the internet.